He has a flat top/mullet combo. His purple outfit has shoulder pads. And he wears fingerless leather gloves. 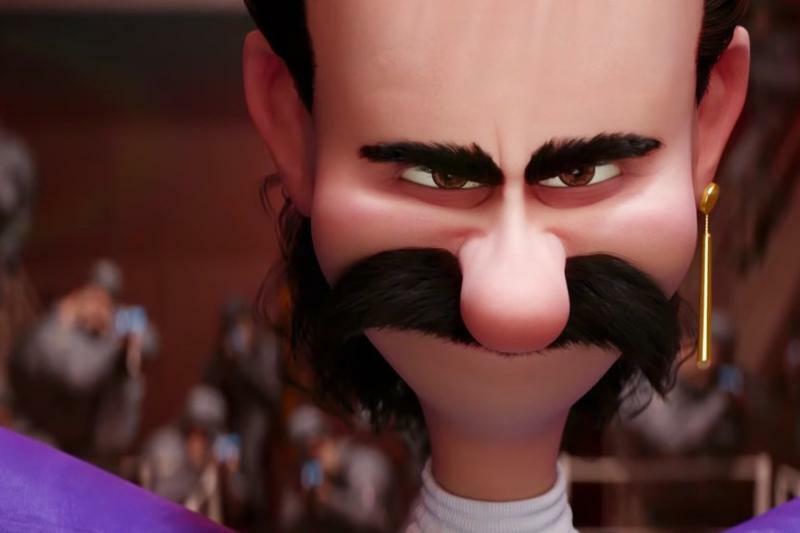 The new villain in Despicable Me 3, voiced by South Park’s Trey Parker, looks like every 80s trend rolled into one, making him both harmless and absolutely hilarious. The Despicable Me franchise lost some of its charm in the 2013 sequel, relying on shenanigans over telling a compelling story. And while the third looks like more of the same, I can’t deny that it looks funny. Seeing Parker’s Balthazar Bratt so hopelessly devoted to his 80s persona makes for solid entertainment—at least in the trailer. However, I wonder if that schtick will wear thin over the movie’s duration. In addition to his outlandish attire and odd choice of heist music, Bratt also enjoys the merits of a good dance fight—something Gru is not entirely interested in participating in. Gru faces off against Balthazar Bratt, a former child star who grows up to become obsessed with the character he played in the 80s; and gets some sibling rivarly when he meets his long lost twin brother, Dru. Meanwhile, the Minions are capture by Mel, a minion that works for Dru, to be experimented with so he can make an army of evil rock star Minions. Balthazar essentially looks like a more eccentric version of Jason Segel’s Victor Perkins, who was the villain of the first film. But, come on! That mullet. Those earrings. That mustache. Dads across America have a new icon and his name is Balthazar Bratt.